Happy 2019! Time for another "what's going on" New Year's article. The back-end of the site has worked reasonably smoothly this year, and we had another year with no huge issues, despite a ton of posts and users surfing the site (in fact, our longest downtime appeared to be roughly a day ago when it was down for a few minutes due to a server issue.) We hit the highest number of concurrent users on the site we've ever had with 811 in 2018. Hacker's Memory came out in most of the world. A number of pop-up shops and specialty events and venues. The amount of products we got in 2018, despite effectively being in 'downtime' for the brand for half the year was still somewhat overwhelming for everyone. Which shows how far things have come in just a few years. There was a lot of great stuff in 2018, but the year ended with some sadness when Toshiko Fujita passed a few days ago. and as mentioned above, tons of other figures and products! While things have been too busy for any real updates on Card Terminal, we've actually put together a few things that might make 2019 it's year. We already have one or two staff people to help on it, and at the moment it looks like we might rebuild the interface from scratch, when there is time. We'll be looking at adding new staff in 2019. We're also especially looking for new translators to keep up the quality of the news, and potentially even expand coverage a bit. The Discord has gotten even larger with tons of fun conversations happening. A few hundred people cycle in and out at different times, and things have been pretty smooth. Feel free to join if you want to chat. Our podcast has a decently sized audience, with the live audience for most episodes growing and actively participating. Our first episode for 2019 will be soon. The Patreon has grown a bit and supports the site on an ongoing basis for server bills, and a few other things. It's grown at a decent rate in the last year, and if it grows more in 2019 will soon hit a reward level where the old 'Leadup' viewing feature will be brought back permanent and ongoing. I promised something big and fun back when we did Digimonukkah. That's still coming, and at one point we heavily intended for it to be ready tonight, but it just isn't ready yet, and when it goes up, you'll see why we waited until it was ready. Doing a rough skim of news, breakdowns, reviews, etc. it appears 2018 had roughly the same amount of news and articles as 2017. When you consider 2017 had Appmon going, tri. going full bore, the 20th Anniversary of the brand as a whole, and that 2018 has arguably been 'slow' for half the year, that's pretty impressive for just how much 'stuff' there has been for Digimon. Rules clarifications and cleaning up are coming, along with a few other things. vBulletin 4 is effectively end of life at this point (minus security updates) and later in the year we will look hard at what we will do about this, going with the assumption that security updates will tap out. As for breakdowns/reviews... in 2017 (by my count) we had 33, and in 2018 we had 29 (far less CDs came out in 2018.) These involved, to differing degrees: scanning, screencapping, editing, rewatching things to write up insights and thoughts, photography, and so forth. These aren't in chronological order, just ordered in a somewhat clean fashion. You can help us continue to do these by joining our Patreon or donating. There are some real fun things coming up (not to mention the eternal hope of numbers being good enough we can go over legacy content also) that we need donations for. Vande- Vande does a lot of heavy lifting for moderating. Lost- He keeps the backend of the site running. theigno- Helps cover the livestream, along with moderation, and suggestions for the site. Shin and Garm- Shin and Garm translate the vast majority of the larger content of the site (and often touching up what I come up with), and improve the content quite a bit via discussions. AR and May- Talking with them on the podcast is always fun, and having differing views and interests on things adds to the conversation quite a bit. onkei- She pops up quite a bit to help with translations, or simply offering information and to lend an ear. Kai- He scans various European releases so that they can be shared with everyone. The mod staff- They help keep the site clean and running smooth. Patreon members and donators- You guys help with the costs of running the place and help to make sure we're able to get ahold of a lot of the stuff we break down, and have made running the place easier and significantly more stress free. I'm sure I've missed someone, and if I have, thanks to you also. After 3 reasonably stressful years, 2018 wasn't perfect, but it was a pretty good year for me, personally, so I think we can upgrade to a happier gif. Hopefully we can all make 2019 even better for everyone. 2018 was a fun year for Digimon, and as mentioned a few times, utterly packed, despite the brand being in downtime for basically half a year. And it's the first time in nearly 20 decades that a major Digimon project ended and we KNEW there would be something else coming, not necessarily years down the line, but soon. How was 2018 for everyone? Looking forward to 2019? Any suggestions for the site, etc? What Digimon stuff did you enjoy from the prior year? The image I used near the top was put on Twitter to celebrate the New Year by Kenji Watanabe, it was the perfect image to use for New Year's here. 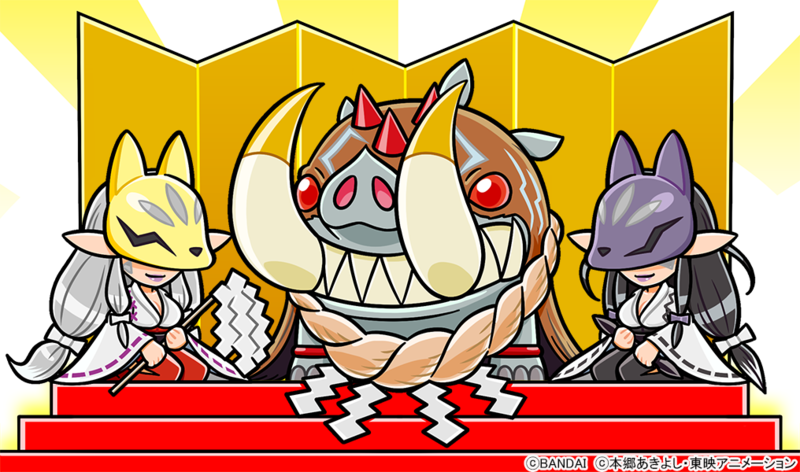 In case you missed it, there were end of the year images from both the official Bandai Digimon Twitter and Digimon Linkz. Update- A New Year's image from Volcano Ota! 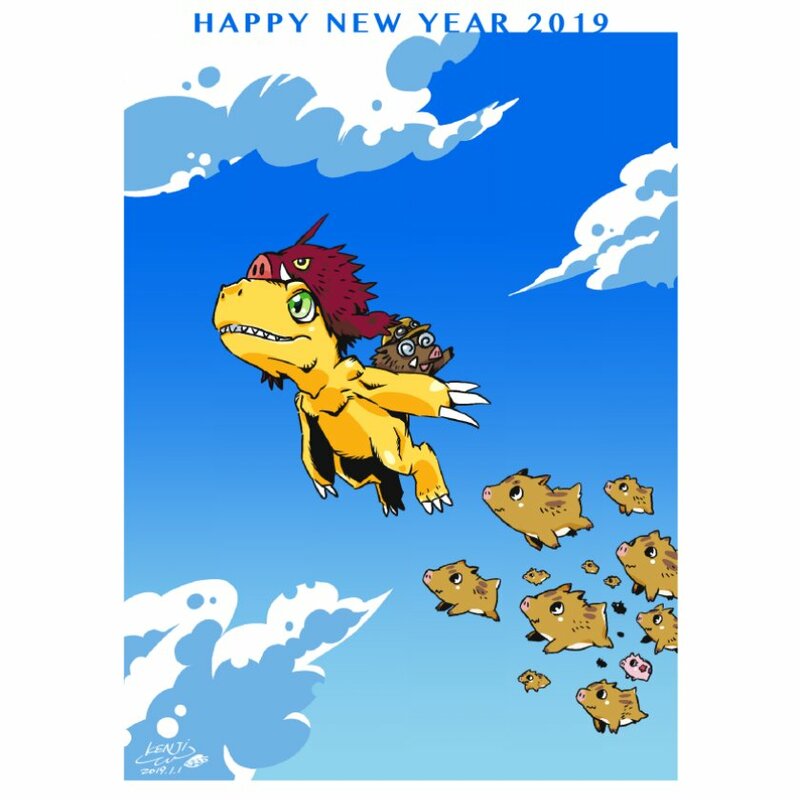 Update- The Bandai Digimon Twitter added a greetings for the New Year image. 2018 was another meh year for me personally due to my many anxiety and depression issues, but it was absolutely wonderful getting to see so much Digimon related stuff after personally not having anything new Digimon wise for like 10 years. I'm excited and hopeful to see new games and stuff come out for me to get my hands on. Hopefully more PS4/Switch games since those are basically the only systems I have for new games now. And hopefully the games have a heavier lean on the Digital World over the Human World. The lack of Digital World in Cyber Sleuth/Hacker's Memory is basically the only complaints I had about the game. Tri was alright, I was kind of hoping the next Adventure stuff was going to be an anime and not a movie, but it seems like that's the direction it's heading in? It just bugs me to have one story spread out over so much time like Tri was. It was super frustrating! Heh, you mentioned the Discord server. Tbh I've been spending more time there than on the forum. 2018 was a fun year for Indian fans too, because we got 5 of the 6 tri. movies on TV, relatively uncut compared to Xros Wars, with no promise of Our Future ever airing. I started off the New Year on a depressing note, crying in the morning, but I hope all my DigiPals here had a less depressing New Year than I did. 2018 has been a great year! As a 911 operator I began training other new operators and I met my goals of signing off on three disciplines. I completed my Digimon WORLDWIDE Digi-battle Card Collection and have almost completed my Digimon Hyper Collesium Japanese Card Collection as well. My wife Ashley celebrated our 10-year anniversarry together and are expecting our first baby girl Zoie in April, 2019! I spent more time with my sisters, and reconnected with myself and my aspirations. My goals for 2019 are to finish paying off my car, lose about 20 lbs, stop stressing and start enjoying my new role as a mom! Maybe buy a house too....maybe....HAPPY NEW YEARS EVERYONE!Also to you staff guys, I'd love to provide any individual card scans or resources for the reopening of the card terminal. Let me know If theres anything I can do to help! Compare to the last year, 2018 had me actually doing something. So that's great. I wish we'd get English Appmon. Come on. Just put it on Disney XD, it'll fit well with Beyblade, Pokemon, and Yokai Watch. It's very kiddy and it does have merch. I wonder what that next movie is like. 2018 was okay for me. I actually had a lot going on; started a new job at the tail end of 2017, plus a lot of medical things, and a new apartment. That's carried me through the year, now I'm looking for a new job and just generally a little more excitement. Once I finish off the medical things, hopefully in a month or so, I'll start knuckling down on things I've been avoiding. If I have any new years resolutions it's probably to be a liiiiittle less cavalier with my money. My credit card bill for this month was insane (Christmas and all, but still). I was depressed for all of 2018 but it could have been far worse; at least it was productive for me in terms of drawing and uploading art. I was also depressed for all of 2017. My depression started in 2016 due to starting to miss months of uploading drawing and uploading art due to an art block and making it worse by wasting the rest of the year starting from July because of how upset I got over my compromised productivity. I let myself down so badly that I caused myself irreversible and constantly agonising psychological damage and lost time and happiness that I will never forgive myself and probably hate myself forever for. I'm trying to achieve something that will get people to appreciate my existence and make me a part of history so I can stop being depressed. Thoughts of forcing myself to be happy, positive and kind to myself make me feel sick to my stomach so for now, the closest I'll ever be to being over it is by successfully distracting myself by working on art that I think will get people to like me so I can feel better about myself. For 2019, at least there's Generation 8 of Pokémon, Digimon Survive, more Steven Universe and the Digimon Adventure 20th Anniversary project to look forward to. 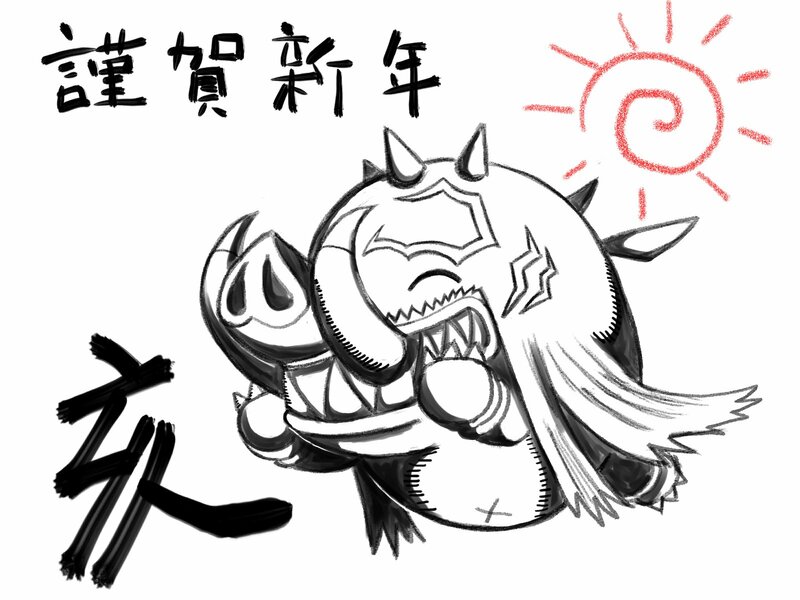 Maybe I'm out of the loop somewhere, but what are those pig digimon with Agumon? I don't think they're from Digimon. They'll be from some other franchise he works for. It's not one I've ever seen before.